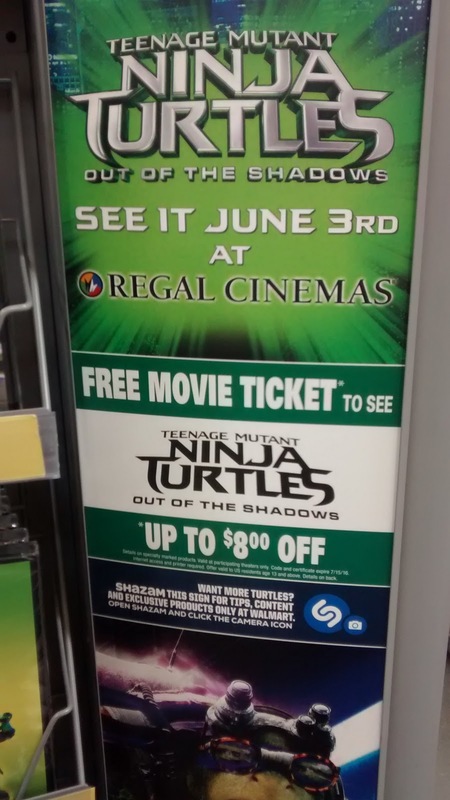 Our Top (TMNT) Teenage Mutant Ninja Turtles Trends for the New Out of the Shadows Film! 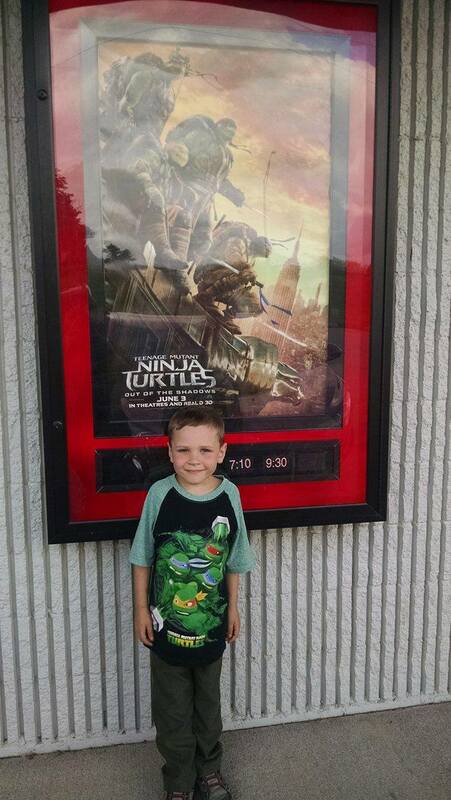 Today was the day I took our family to see the new Teenage Mutant Ninja Turtles (TMNT) Move: Out of the Shadows. It was in celebration of my soon-to-be-6-year-old son's birthday. Marcus LOVES the Turtles! Graphic tees: There were some really cool designs this year, including some awesome raglan tees. 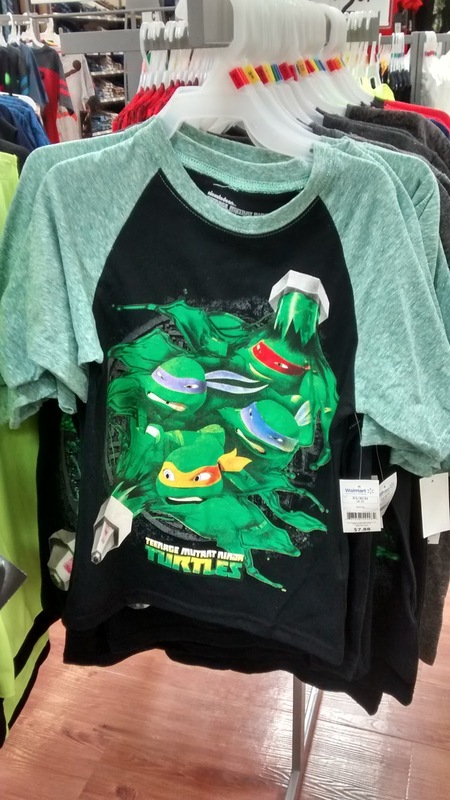 Even Manny found some retro-style t-shirts and a 24-month 2-piece"Turtle-y Awesome" short set (just $7.97!) to wear. There were designs from infant all the way to adult! 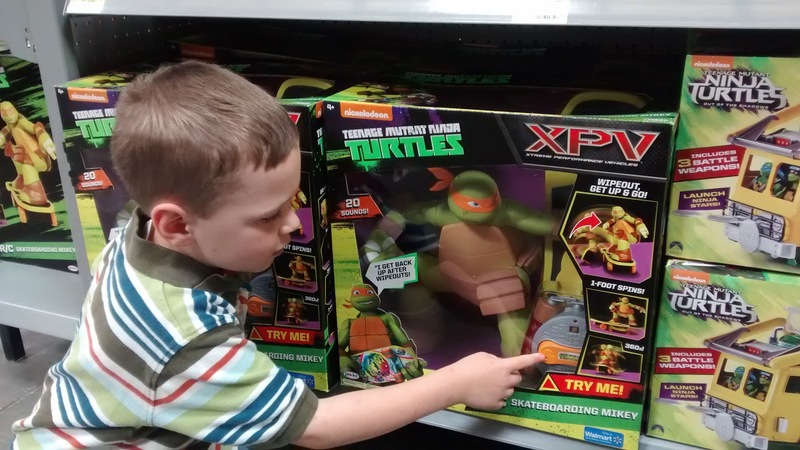 Toys: Yes, there were lots of TMNT toys in our store! The coolest, in my son's opinion, were the XPV Remote Control Skateboarding Mikey. It has 20 cool sounds and wipe-out action that lets it get back up on the board every time! There were really too many toys for a kid to choose just one. Marcus also though the Battle Sounds Turtles were "totally awesome!" DVDs: Just in case you wanted to walk down memory lane and catch the vintage movie DVD's, there were plenty at my store. 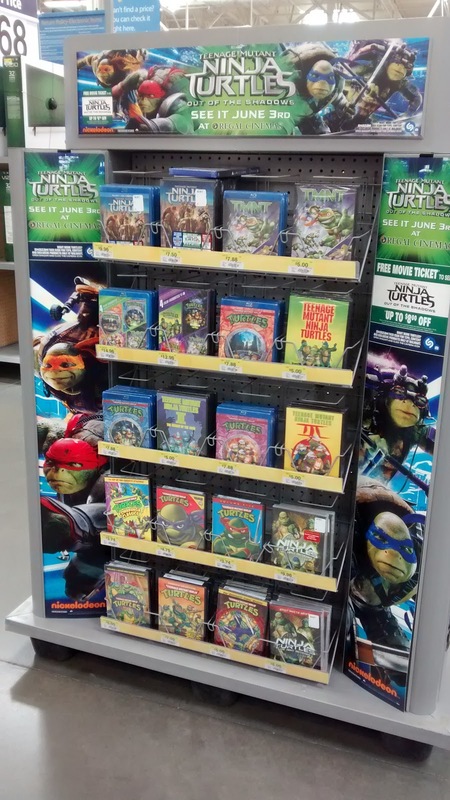 There were also DVD's of the older cartoon series, and the first Teenage Mutant Ninja Turtles movie starring Megan Fox! The display was set up so that you could also interact with it. By scanning the in-store sign with the Shazaam app and the camera on your phone, you could unlock exclusive TMNT content and find even more Walmart merchandise not found anywhere else! 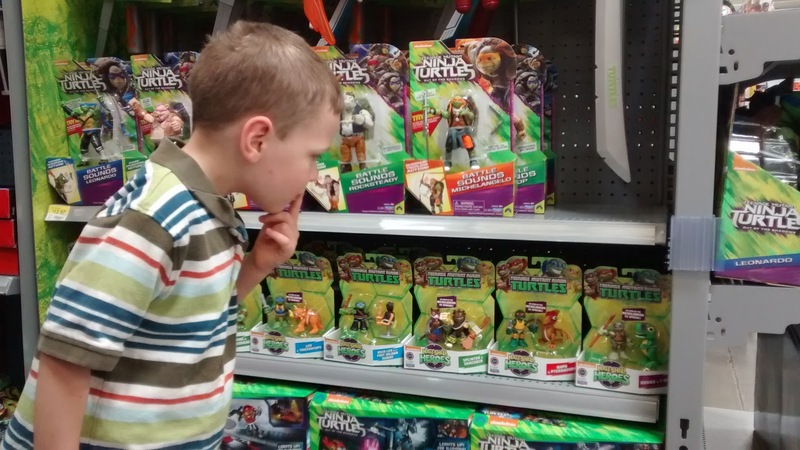 While I would have loved to give my boys ALL the very cool TMNT gear, there is only so much we can get at a time. 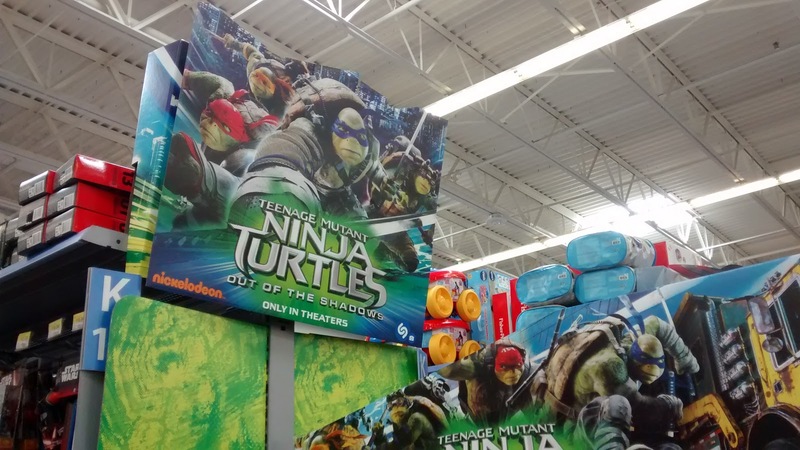 Future items that Walmart carries that I'm sure will be on our "must-have" list include the Tactical truck with Leo, 1990's Collectible action figures (which are out of stock online but available in stores) and the fishing pole! Big fans of the franchise have just one place to go to get all of their turtle shopping needs met: Walmart! Did you catch the flick? My kids loved all the action. I especially liked the ending credits, where they played an updated version of the original Teenage Mutant Ninja Turtles theme song. It really brought me back!